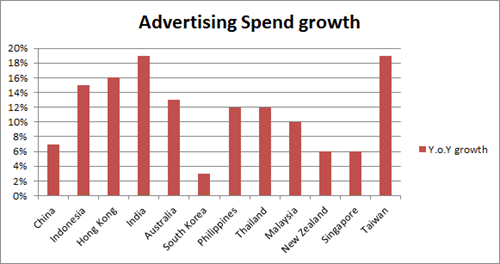 According to latest Nielsen report, India and Taiwan are seeing highest growth in Ad spending across Asia Pacific Region. 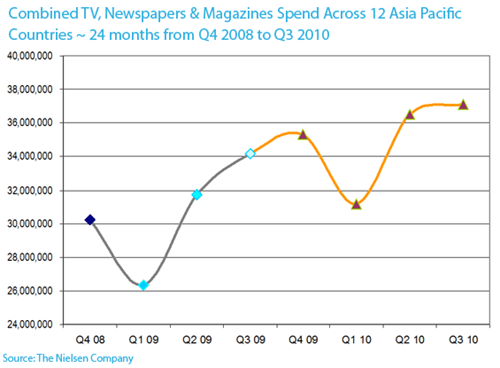 India registered 19 percent growth compared to 3rd quarter of 2009 as compared to average Asia Pacific growth of 9 percent. Double digit % increases across 8 markets including strong performances by four of the top 5 markets –Indonesia and Indonesia (both +32%), Hong Kong (+24%) and Australia.